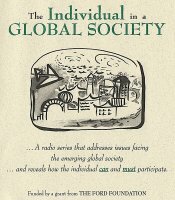 "The Individual in A Global Society" was a project of the American Society of International Law and the Dean Rusk Center for International Law at the University of Georgia. It was produced by WUGA-FM, a broadcast service of the University of Georgia. The series was written by Dorinda G. Dallmeyer and David A. Bryant. Airing internationally in 1998, the series received the 1999 New York Radio Festival Bronze Award for Business and Consumer Issues as well as being designated a finalist in the best sound category.